"I'm a Vietnam veteran, I'm here tonight to say, this war is wrong, this government lied to me, lied to my brothers, the people in this country tricked us into going thirteen thousand miles to fight a war against poor peasant people who have a proud history of resistance who have been struggling for their own independence for one thousand years, the Vietnamese people. I can't find the words to express how the leadership of this country sickens me, people say "if you don't love America, then get the hell out." Well, I love America, we love the people of America very much, but when it comes to the government it stops right there, the government are a bunch of corrupt thieves, they are rapists and robbers, and we are here to say "we don't have to take it anymore", we are here to tell the truth, they are killing our brothers in Vietnam. This wheelchair, our wheelchairs, this steel, our steel is your Memorial Day on wheels, we are your Yankee Doodle Dandy come home. - from the movie "4th Of July"
Turns out I'm a 33 percenter. I found that out in this article about Ken Burns and Lynn Novicks new documentary on Vietnam. Fact: Two-thirds of Americans who served in Vietnam are no longer alive. 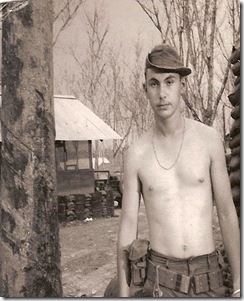 I served in Vietnam/Cambodia in 1970 as a combat Engineer (EOD) with the 31st Eng. Battalion. Let me first say, I've seen all of the iconic movies about Vietnam from, Apocalypse Now, Born on the Fourth of July, Coming Home, The Deer Hunter, Full Metal Jacket and Platoon. I've also seen journalist Stanley Karnow's, award-winning, 13-part PBS series Vietnam: A Television History. I couldn't help wondering what else could Ken Burns and Lynn Novick add to Karnow's award-winning documentary? The answer lies in the telling of the whole story, according to the producers. Viewers will get a better understanding of the terrible losses Vietnam sustained - 3 million deaths in a population of 30 million. Vietnam was heavily polluted with Agent Orange, and nearly bombed back to the stone age. Viewers will hear interviews with 90 Vietnamese soldiers/civilians and 90 American soldiers who survived the chaos. In other words, we'll hear the other sides story. This documentary promises an epic 10-part, 18 hour series, with rarely seen archival footage, photographs, TV broadcasts, home movies and secret audio recordings from the Kennedy, Johnson and Nixon administrations. The background music - Gotta love it! The Beatles, Rolling Stones, Bob Dylan, Jimi Hendrix and Simon and Garfunkel, reflects the hits of the period. I agree with Gioia. I'll watch this new series with an eye to more details, and hope that it sends a strong message to generations today. Who knows? I might even get a glimpse of myself as a teenager fighting to survive. The series premieres on the Public Broadcasting Service (PBS) September 17th in the US, and will be released in full on DVD in the UK.